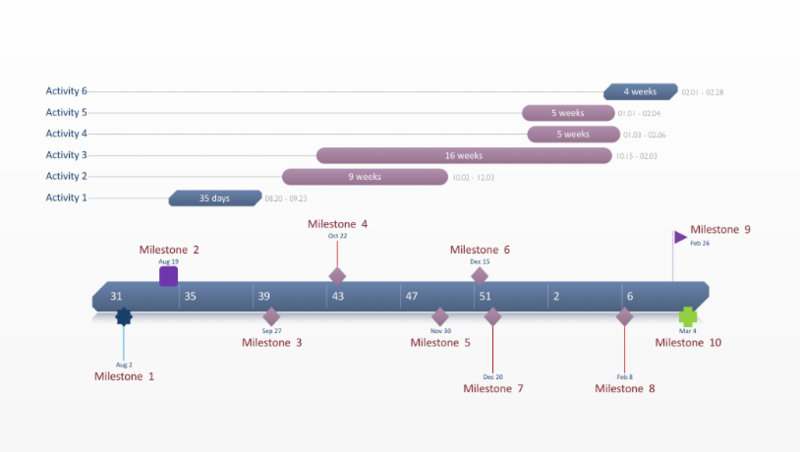 posted a similar step-by-step article that shows you how to make an Excel Gantt chart or timeline. Many of the steps are similar. 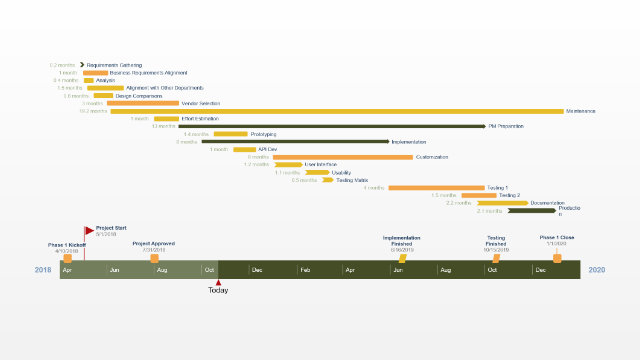 If you wish to learn how to make a timeline in Google Docs, please see our timeline tutorial here. 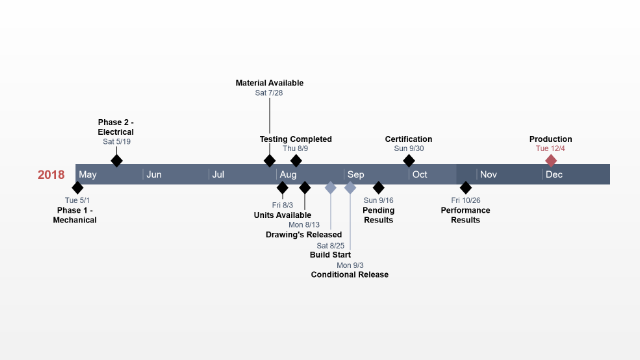 A Gantt chart is a critical project management tool for anyone working on a project. 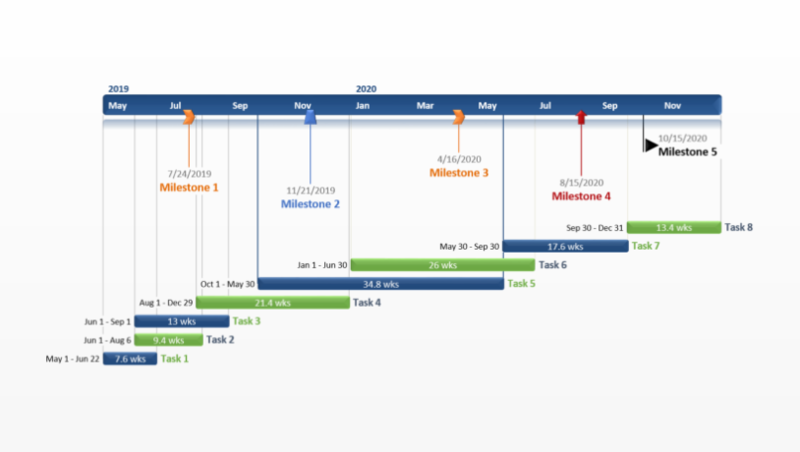 Gantt charts help visualize the project schedule and status, which makes them useful particularly when communicating with project stakeholders. 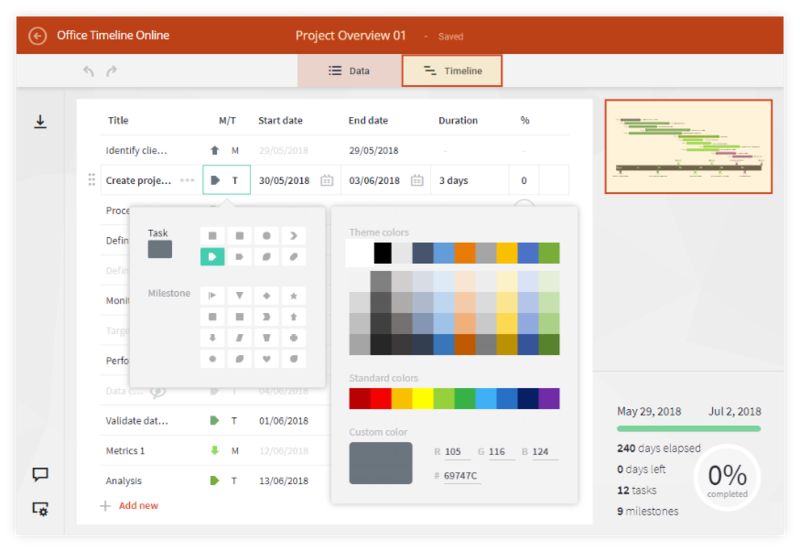 There is a lot of Project Management software available to manage projects, but these tools create complex schedules that are often too confusing for executive reporting or client reviews. 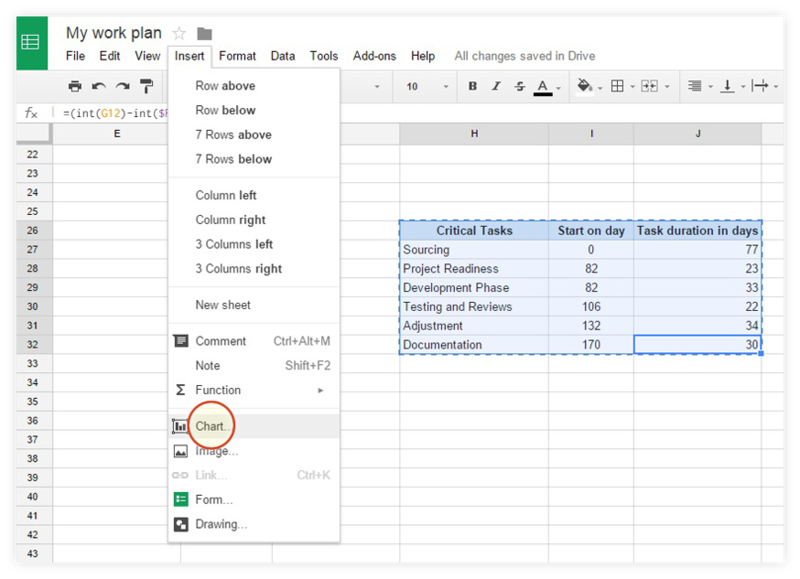 Google Docs are easily editable and accessible from the cloud, which makes them useful for collaborating on projects. 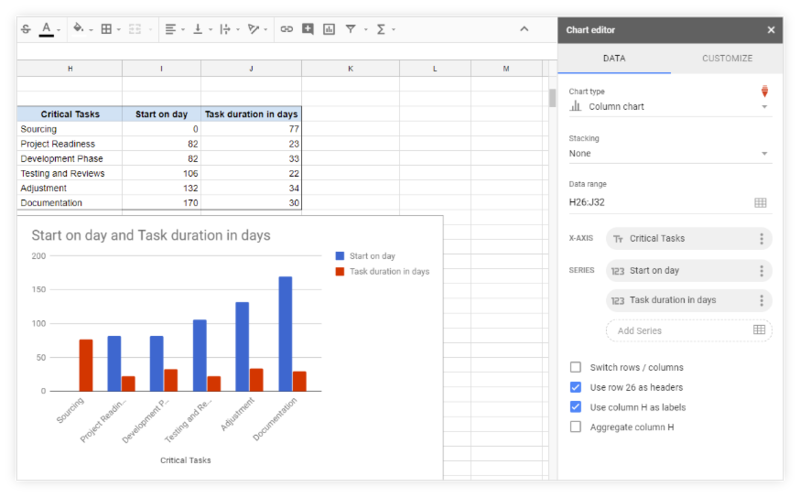 Although there is no native Google apps solution for project management, Google spreadsheets is perfectly suitable for tracking project schedules. When it comes time to presenting those schedules to customers or management, you will need to create a Gantt chart. 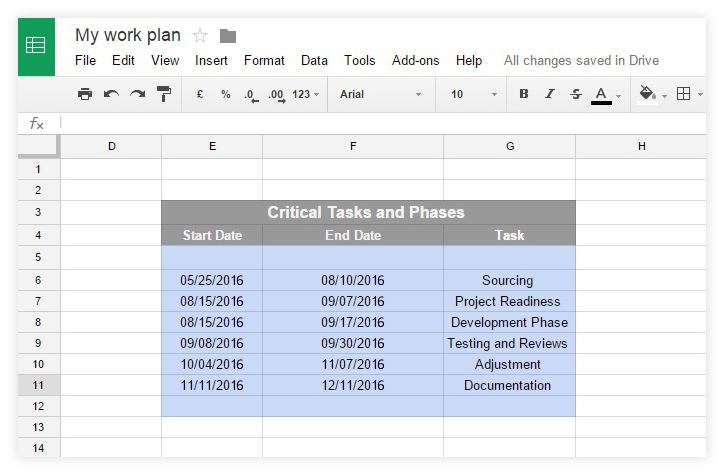 I will show you how to easily create a simple Gantt chart in Google Docs. 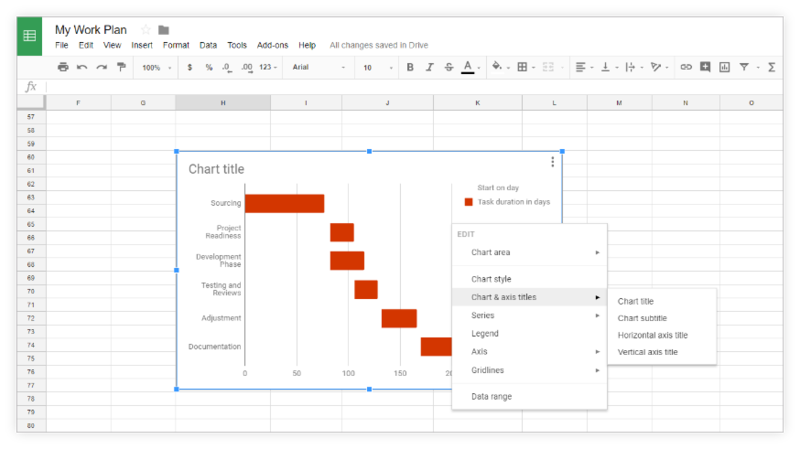 If you have access to Microsoft PowerPoint, I will show you how to turn your Google Docs data into a beautiful Gantt chart or timeline, which may be better suited for project reporting. The short video at the bottom of the page demonstrates how to do this. 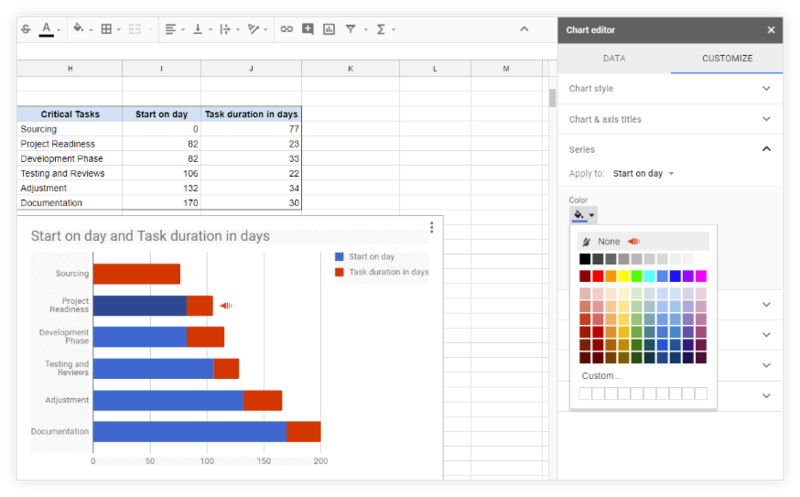 Below I will demonstrate how to manually create a simple Gantt chart in Google Docs. If you wish to create more professional visuals for high-level presentations, I will show you how to instantly turn your data into a beautiful Gantt chart using a free browser-based tool called Pincello. 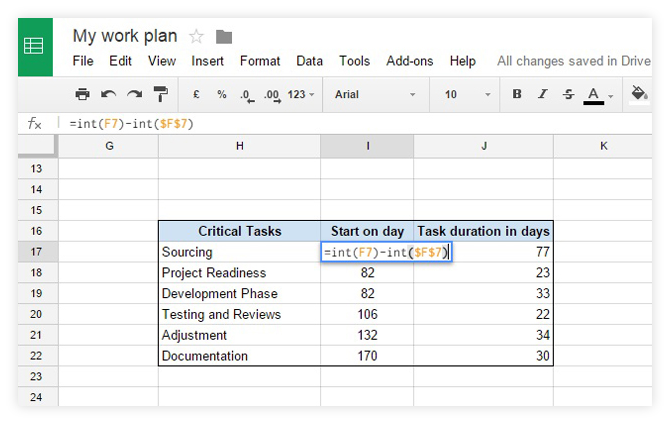 Set up your Google project management spreadsheet by building a table for your project schedule. 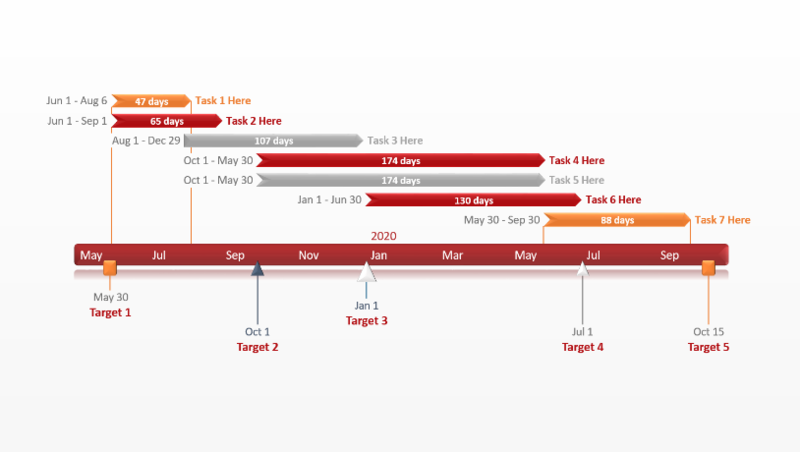 As shown below, it should include the description of your tasks or phases and the start and finish date for each of them. The first column will be your Task Descriptions copied exactly from your original table. In my new table, I called them “Critical Tasks”. To copy them from your original project schedule with a formula, in the first cell of your new table type “=” and then click on the cell with the title of your project description in the original table. You can repeat or simply drag the corner of this cell downward and your formula will be copied for each of your task descriptions. I called my second column “Start on Day.” Basically this column figures out the day into the project each of your tasks will begin on. So the first/earliest task will obviously start on day 0. To calculate this column, use the following Google spreadsheet formula as shown below: =int(F7)-int($F$7) and in the cell beneath =int(F8)-int($F$7). This formula translates into: This Task's Start Date – The First Task's Start Date (in my example, cell F7). See more Google Spreadsheet formulas here. 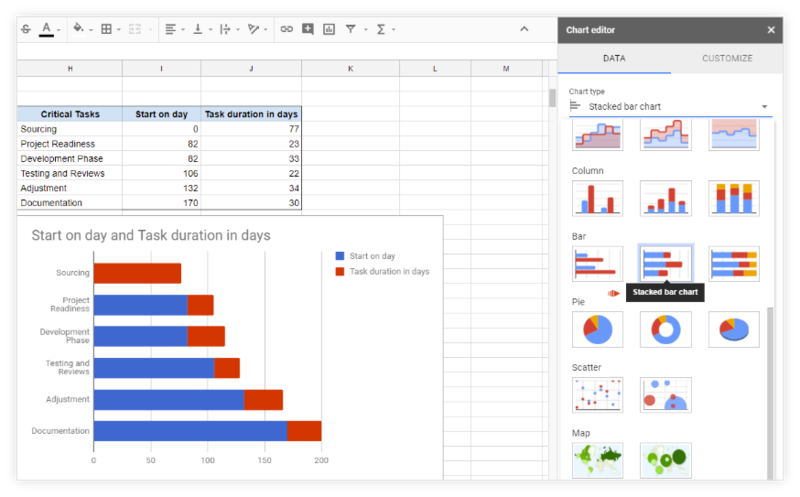 I called my third column “Task Duration in Days.” In this column, Google Spreadsheet figures out how many days each of your project's tasks will go on for. In my example, the first task, Sourcing, will last for 77 days. 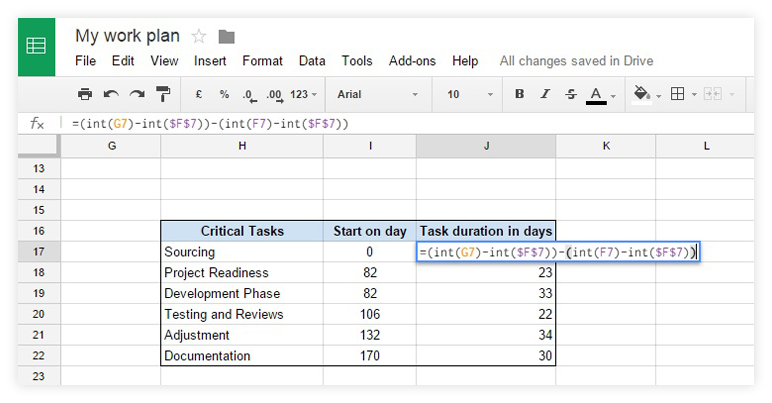 Calculate this for each of you tasks using this Google spreadsheet formula as shown below: =(int(G7)-int($F$7))-(int(F7)-int($F$7)) and in the cell beneath =(int(G8)-int($F$7))-(int(F8)-int($F$7)). This formula translates into: (This task’s End Date – the first task’s start date) – (this task’s start date – the first task’s start date) = Task Duration. Click in the corner of your new table and select all the data in it. Navigate to the “insert chart” icon on the Google Docs ribbon and select “Chart” from the drop down menu. On the Chart Editor, in the Data tab, click the drop-down arrow under the "Chart type" header to open the menu. Scroll down the Chart type menu until you reach the Bar section and select the Stacked Bar Chart. Now, select any of the "Start on day" bars on your chart (the blue ones, in my case) and, from the Customize tab in the Chart Editor, change the color to "None" as shown in the image below. Once you have created your chart, you can rename it, add horizontal and vertical axis titles, and make other customizations by right-clicking anywhere on the graphic. 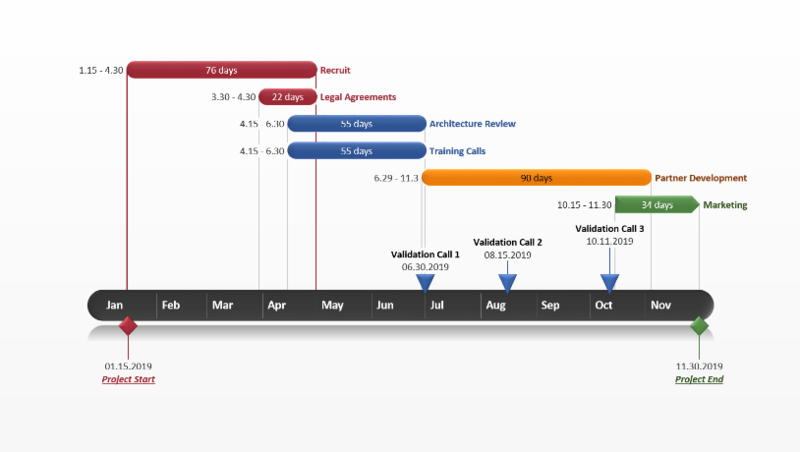 With an online Gantt chart creator like Pincello, you can instantly convert your project data into an impressive visual that can be used for project management purposes, such as client meetings or stakeholder reviews. 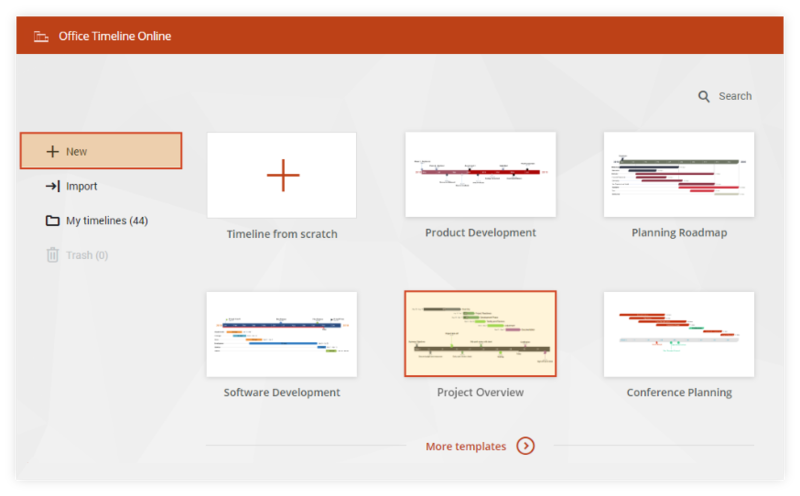 The tool lets you easily update or restyle your Gantt chart and download it as an image or a native PowerPoint slide to include in presentations. 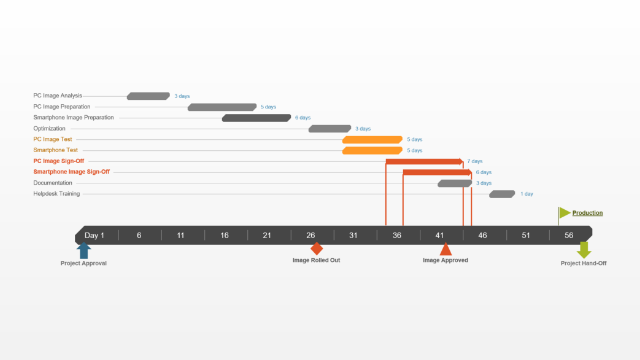 To begin, open the free Gantt chart maker in your browser and follow the steps below. If you wish to show more than 10 tasks or milestones on your visual, you will need to upgrade to Plus Edition. 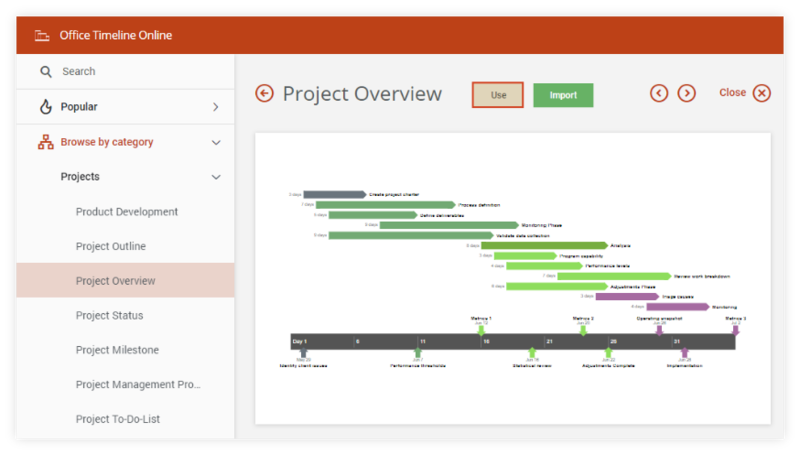 From the New section in Pincello, select one of the various templates provided or click on Timeline from scratch to start your Gantt chart. 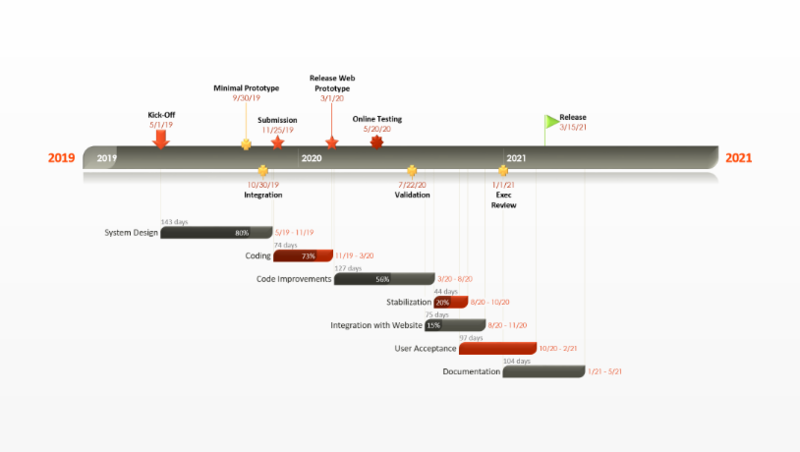 For this example, I will be using the "Project Overview" template. Once you click on a template, Pincello will open a large preview of it with a menu that lets you browse through all the other designs. If you're happy with the template chosen, click on the Use button to go to the Data View, where you can add or edit data. In the Data tab, replace the template's data with your own tasks (T) and dates. You can add milestones (M) too or make some quick styling choices here, such changing task shapes and colors. As you edit items, you'll notice that Pincello updates your Gantt chart in real time and displays a live preview of it on the right. When ready, click on that preview or on the Timeline tab to go to the Timeline View, where you can customize every detail on your Gantt chart. The Timeline View is where the real magic happens. Here you can personalize everything with a few clicks – you can instantly change any font, color, shape, position or date format, or add extra details such as Today's Date or Elapsed Time. In my final Gantt chart below, you can see I've played with different milestone sizes and shapes, formatted fonts, and switched on the Percent Complete indicator for tasks. With a free Pincello account, your Gantt chart will be automatically saved in the cloud, so you can access and update it easily whenever needed. Drag & drop tasks and milestones in Timeline View to adjust their dates on the fly, or use the Data View to edit, add or remove items effortlessly. 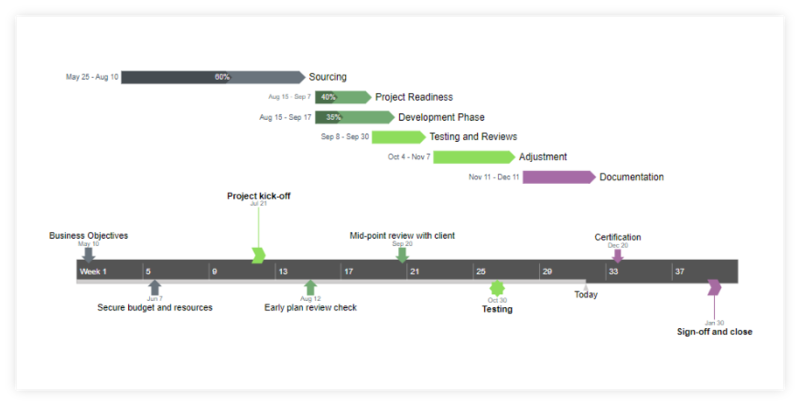 When ready to present your Gantt chart, you can download it as a .png image or as a native PowerPoint slide with all objects fully editable. 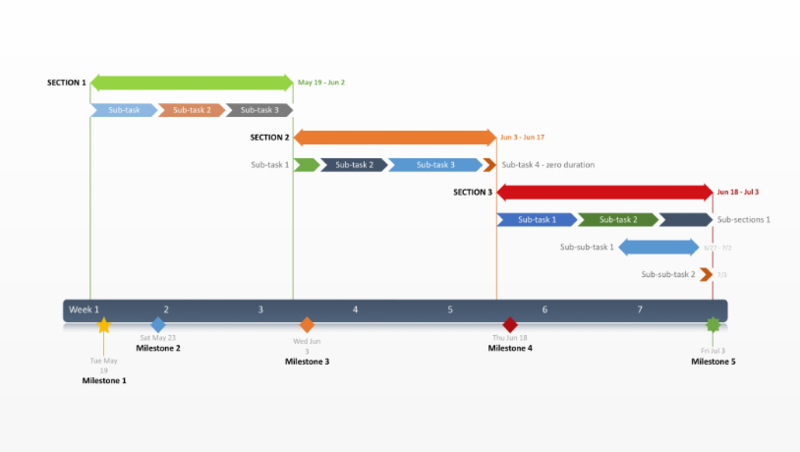 This free Gantt chart template gallery was created for professionals who need a simple, stylish way to present plans and schedules to high-level audiences. Download the template you like to update it in PowerPoint or, where available, click on Edit Online to open it with our online Gantt chart maker and edit it more easily.